The ProComp 2 is a compact yet powerful two-channel device that allows clinicians to set up a second clinical system - or to empower their clients by offering them a take-home device that is convenient to wear on a headband or a shirt collar. The ProComp 2 contains a built-in EEG sensor (simply connect an extender cable for EEG monitoring and biofeedback), and it can use any two of the ProComp Infiniti sensors. 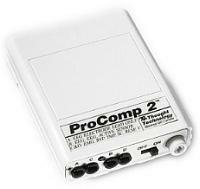 The ProComp 2 system contains all the peripherals to easily connect it to a desktop or laptop IBM-compatible PC. 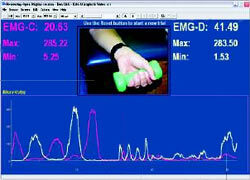 The Infiniti software is able to record up to 2 video channels along with force, goniometry and physiological data. The video is usually acquired from a WebCam device connected to a USB port. Click here to learn more about accessories for this product. ProComp 2 is a trademark of Thought Technology Ltd.